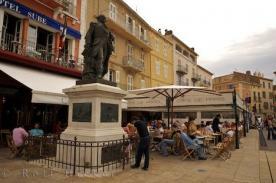 One of the main economic resources of Saint-Tropez is tourism. Saint-Tropez is well known for the Hotel Byblos (and Les Caves du Roy), a member of the Leading Hotels of the World, whose the inauguration with Brigitte Bardot and Gunter Sachs in 1967 was an international event. Each year, in early October, a regatta is held in the bay of Saint-Tropez. This is a draw for many yachts, some up to 50 metres in length. Many tourists come to the location for this event or as a stop on their trip to Cannes, Marseille or Nice. Tropezien beaches are located along the coast in the Baie de Pampelonne also know by the residents as Grania, which lies south of Saint-Tropez and east of Ramatuelle. Pampelonne offers a collection of beaches along its five kilometre shore. Each beach is around thirty metres wide with its own beach hut and private or public tanning area. Many of the beaches offer windsurfing, sailing and canoeing equipment for rent, while others offer motorized water sports, such as power boats, jet bikes and water skiing. Welcome with the house Les Mesanges. Situated 3 km from St. Tropez the house of hosts opens to you with its 4 rooms, its park of olives its kitchen garden, its vines and its teracces overhanging for the heat of days. 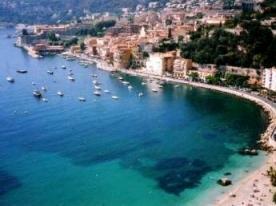 Do you have, or know of, a company or business that operates in Saint Tropez?